Numerous reports and studies have shown the phenomenal rise of Asian research output and citation impact over the last decide. The underlying reason for this phenomenon is clearly identified in a new report from the UNESCO Institute for Statistics (UIS) based on data from the UIS, Scopus and other sources. 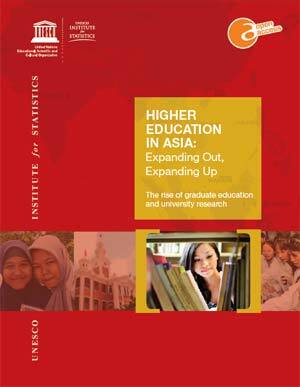 The 165-page report, Higher Education in Asia: Expanding Out, Expanding Up, is designed to help governments in Asia and beyond to adopt an evidence-based approach to policy, and evaluate the policy tradeoffs of "expanding up," with greater emphasis on graduate degrees and research than in the past. 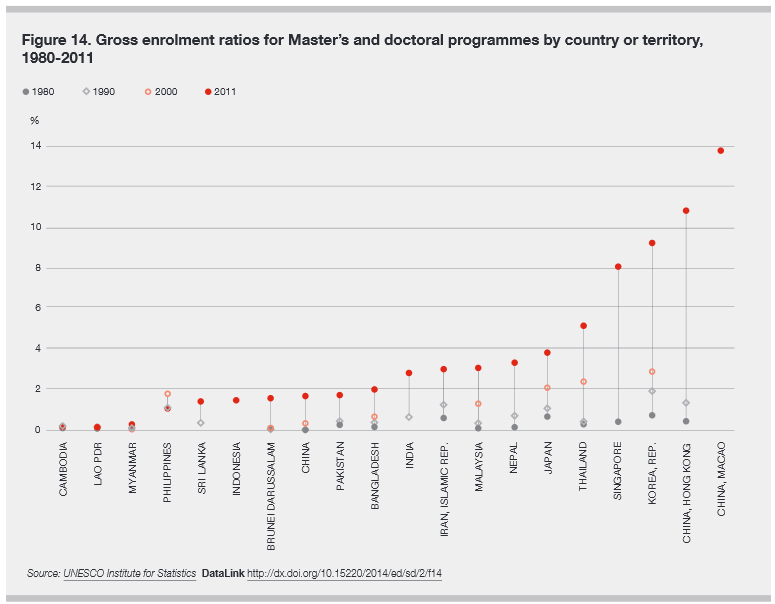 The expansion of higher education across most countries of Asia over the last 20 years is a success story, but with its own set of new challenges. Graduate education was expanded, in large part, to prepare instructional staff to serve the growing undergraduate population but also to further research and innovation in ways that would accelerate national economic development. This expansion placed new demands on government funds, potentially competing with the very sub-sector that it was trying to serve (undergraduate education). Professor Rajata Rajatanavin, President of Mahidol University in Thailand, attributes the rapid expansion of higher education in Asia to "the dramatic increase in demand for highly skilled labor," and said it has brought significant challenges to universities in terms of staffing and other resources. "We view studies such as this report as crucial in helping universities and government bodies to establish strategies grounded in solid scholarly evidence," he said. The report also compares the three most prominent university ranking systems and notes that these rankings change over time to respond to methodological criticisms and to capture new market opportunity. While university rankings continue to be controversial, they nonetheless influence both government and institution-level priorities. Further analyses found in the report highlight that less than one third of Asian top 40 universities with world class research performance in at least one niche area are ranked among the world top 100 universities by these rankings. UIS Director Dr. Hendrik van der Pol said directing more funding to top-tier universities means that pockets of excellence elsewhere might be overlooked: "In terms of national development, countries might benefit more by supporting these emerging universities that are excelling in niche areas but may not yet appear in international rankings." 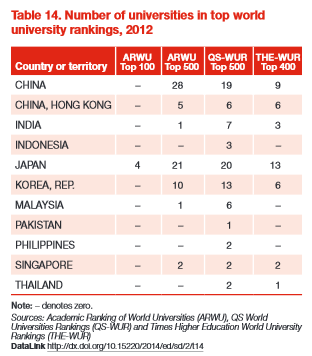 TIMES Higher Education: Asia: Does university R&D really create economic growth? 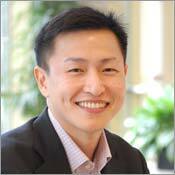 Inn Beng Lee is Customer Discovery and Innovation Director for Elsevier in the Asia Pacific region. 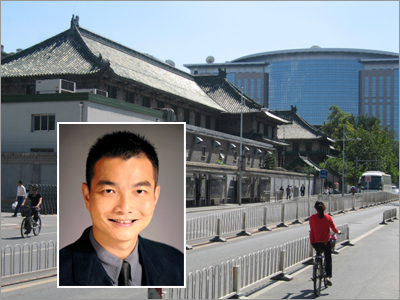 He has over 17 years of experience in higher education, and has a strong interest in advancing Asian research visibility and research collaboration. The establishment of the Expert Content Advisory and Selection Committee program across Asia and the UNU-IIST led Global Research Benchmarking System are among the programs he has initiated to widen collaboration between Elsevier and the scientific research community. He is also an active supporter of poverty reduction programs in the Philippines and Laos People's Democratic Republic since 2008. 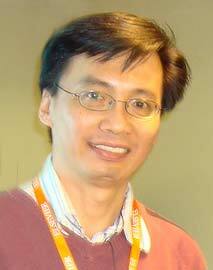 He served as Programme Officer for Resources and Development for United Nations University from 2011 to 2013. 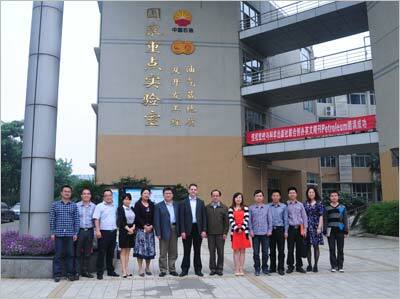 Inn Beng holds a MBA from the University of Nottingham in the UK.